A hot, dry start to 2019 saw Bay of Plenty beachgoers enjoy record high temperatures. And with NIWA predicting below-normal rainfall for the upper North Island over the coming months, the region’s farmers will be thankful for the pre-Christmas drenching that gave the grass a good push before summer set in. With more than 30 years’ experience as a dairy farmer, Edgecumbe TSR Derek Gibson is well-versed in managing feed deficits over summer. "At the moment we’re focusing on maintaining production levels and keeping protein in the feed while balancing intake," says Derek. 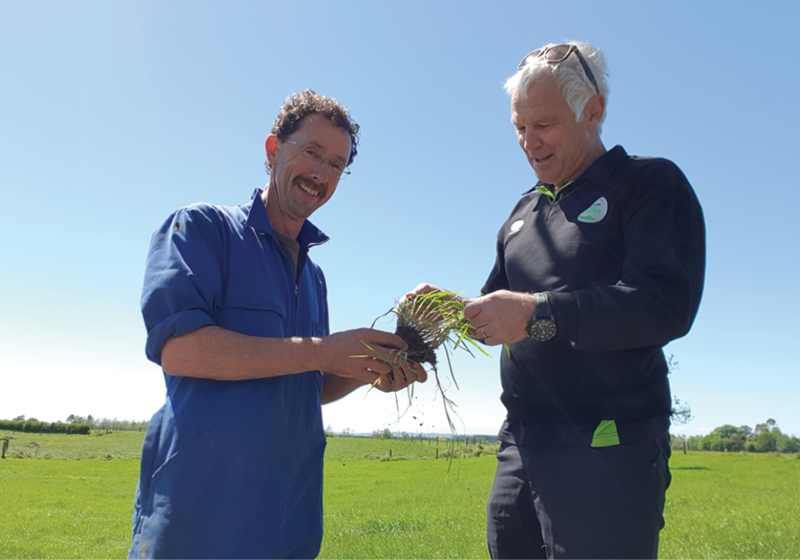 Controlling summer weeds, especially paspalum, and looking at Facial Eczema spore levels are also on the agenda for Derek’s farmers in the greater Whakatane area he covers. He’s been TSR for the Edgecumbe Farm Source store for 18 months and before that spent two years as the TSR at the Opunake store in Taranaki. With so many dairying years under his belt, Derek’s developed close ties to the dairy industry; he’s worked as a tutor and training advisor for Agriculture ITO and has been involved with Federated Farmers Dairy at regional and national levels. This know-how is undoubtedly appealing to his farmers and part of the reason they turn to him for advice. "I have a lifetime of both farming experience and contacts in the industry. I endeavour to provide farmers with practical solutions that are the most cost-effective," he says. "It’s trusted advice from someone who understands their farming business." Last year, for example, Derek’s cropping expertise came in handy when he helped a farmer sort out a weed issue. "A farmer had sprayed-out and sown Hogun annual rye grass to provide winter feed, but he had an area which was infested with yellow bristle grass. "He wasn’t sure what to do as it was dying off in late November and he didn’t want to cultivate it as moisture levels weren’t enough for germination. "I suggested we spray out with Weedmaster and cross-drill a chicory crop at 12 kilograms (kg) per hectare (ha). "The farmer was very happy with the result as germination was excellent and, along with good plant population, it has allowed him access to a great source of protein for his summer milk production, as well as controlling summer weeds," he says. For Derek, one of the best things about the TSR role is the opportunity to build lasting relationships with farmers and their staff. "I enjoy working alongside farmers and understanding their farming strategies and goals on farm and seeing them achieve results through our advice and expertise," he says. Like any job, the TSR role has its challenges. For Derek, it’s keeping abreast of all the new technology that is now available for use on farm and maintaining his knowledge on new products and regulations, which he describes as "a moving target." "Thankfully, our vendor reps are only a phone call away and they’re invaluable in providing up-to-date technical information, usually within hours," says Derek, who believes the integrated co-op model helps set Farm Source apart from competitors. A member of the Whakatane Athletics Club, Derek enjoys cycling and walking around the Bay of Plenty with his wife, Wendy. The father of three and grandfather of four is a keen board rider too. "We live on the coast and I enjoy getting out in the sea on my board after work and weekends."